goes out to all Altadenablog readers and friends who contributed to our team, Rosie's Blue Lobsters, at last weekend's Down Syndrome Association of Los Angeles Buddy Walk! We raised over $1,300 to support families and individuals with Down Syndrome! Thank you again for your support! 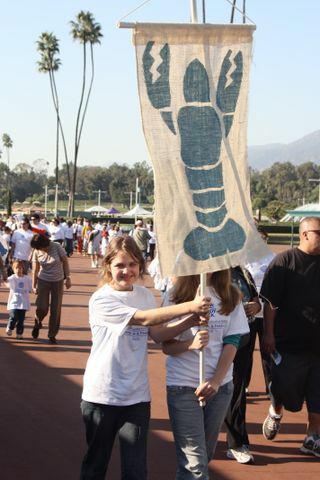 (Photo: Rosie's big sister Mimi and hidden friend Lilly carry the Blue Lobster banner at Santa Anita Park on Sunday).